Neuro-linguistic programming (NLP)(1)is an approach to communication, personal development, and psychotherapy created by Richard Bandler and John Grinder in California, United States in the 1970s. NLP’s creators believe there is a connection between processes of the nerves (neuro-), language (linguistic) and behavioural patterns learned through experience (programming), and that these can be changed to achieve specific goals in life. Bandler and Grinder also state that NLP methodology can “model” the skills of exceptional people, allowing anyone to acquire those skills. Neuro relates to the nervous system. Our neurological functioning is influenced by the information we take in through our senses. Our first mental map of the world is constituted of internal images, sounds, tactile awareness, internal sensations, tastes and smells that form as a result of the neurological filtering process. The more accurately we take in information i.e. the more we listen, the more we observe and the more open we are to each other’s feelings, the more we will be able to take appropriate action. Linguistic is about assigning language. We make sense of the information being received from the world outside. We form our second mental map by assigning language to the internal images, sounds and feelings, tastes and smells, thus forming everyday conscious awareness. The more we understand and are aware of the language in all its forms – the choice of words, the structure of the sentences and the way we say those words (tone, volume, rhythm, body language) – the more we will be able to take appropriate action. Programming refers to the behavioural response that occurs as a result of neurological filtering processes and the subsequent linguistic map. We develop structures, habits, and beliefs. Some of those are useful, some are limiting. The more we are aware of our behavioural responses, the more we will be able to take appropriate action. 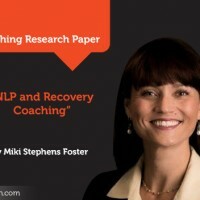 Why use NLP in Executive Coaching? NLP is a set of tools and techniques that help people understand the power of their own mind and subsequently achieve their goals. An NLP coach can understand the reality of how a client thinks and can use language very precisely to help that client reach their desired outcome. 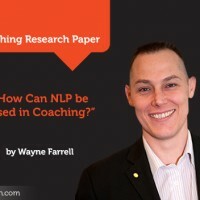 There are a few NLP principles that an executive coach could use to build rapport with their client, provide powerful questioning, explore what’s coming in the way of the clients’ achieving their professional goals and support the client overcome those obstacles. The first NLP principle is that everyone builds their own maps of reality. It could be called also the subjectivity principle. These maps, or worldviews, are filtered by our senses, experiences, beliefs, and neurology. Many of the challenges we have are based upon our perception of the world, not the world itself. According to Bandler and Grinder, we create subjective representations of our experience. These subjective representations of experience are constituted in terms of five senses and language. That is to say our subjective conscious experience is in terms of the traditional senses: 1) sight, 2) hearing, 3) touch, 4) smell, 5) taste such that when we hear an activity “in our heads”, recall an event or anticipate the future we will “see” images, “hear” sounds, “taste” flavours, “feel” tactile sensations, “smell” odors and think in some language. Behaviour can be described and understood in terms of these sense-based subjective representations. Behaviour (in self and others) can be modified by working on these sense-based subjective representations. Second these subjective representations of experience have a discernible structure, a pattern: that is the second NLP principle. It is in this sense that NLP is sometimes defined as the study of the structure of subjective experience. Individuals arrange their experiences in a certain way in their mind and that determines what those experiences mean to them and how it affects them in the present. So, by integrating this principle, NLP coach can help a client understand how they think about their values and beliefs, how they create their emotional states, how they build their internal world and give it meaning. Third, it is one of the premises of the NLP is that if one person can do it, anybody else can learn how to do it too. This third principle is also called the principle of learning. That goes back to how NLP was created: excellence and achievement have a structure that can be copied. When individuals use their brain in the same way as successful people, they can achieve similar results. NLP utilizes an imitative method of learning, called “modelling” that is claimed to be able to codify and reproduce an exemplar’s expertise in any domain of activity. An important part of the codification process is a description of the sequence of the sensory and linguistic representations of the subjective experience of the exemplar during execution of the expertise. The fourth principle is that the mind and body are part of the same system. If people change their body language, then their feelings and abilities could change. For example, if someone changes their posture, expressions, breathing patterns, then their thoughts will start shifting and that could improve the way they feel. The fifth principle is that everyone has the resources they need or can acquire them. An image, a sound or a feeling is a resource. People can form pictures in their mind and those pictures could be great visions that will help and guide them. Similarly, when people call upon the memory of a feeling, they can transfer it to the present and use it as needed. A coach always treats the client as resourceful. The coach does not have the answers, the client does. 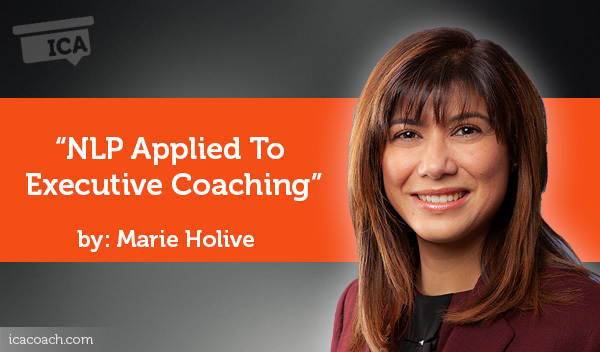 So, what does NLP bring to executive coaching? Speed: NLP techniques work quickly which is highly valued by executives. A pragmatic approach: it uses what works for successful people and adapt it to everyone. If what a client is doing does not work, it offers ways to try a different approach. An appreciation of the uniqueness of everyone: every client has his or her own maps of the reality. 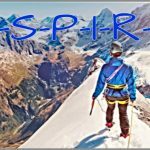 Simple techniques: several tools that will be described in the next section are very simple and they are tailor-made for coaching. Executives can learn how to use them by themselves and become more successful in a sustainable way. An appreciation of how goals, beliefs and values interact. This is the essence of coaching. Executives with a purpose and goals aligned with their values will be much better positioned to succeed. Rapport and trust. NLP helps build the prerequisites of a good coaching relationship. In the next section, we will go into specific NLP tools an executive coach could use with the client and how they the principles above come into play. Executives come to an executive coach with a set of objectives: the NLP toolkit will help the client create the changes they need and get to the desired outcome. We will use the following case study to illustrate the selected NLP tools. In his new role Mark has to do more public speaking and he is extremely nervous about being on stage in front of a big audience. Mark has an office but that one is smaller than his predecessor and he feels undermined by it; he would like to move to the corner office that his predecessor had. Mark feels that everybody wants him to fail even if he got the job through a challenging interview process. That belief is limiting his actions and bringing his energy down. On top of that Mark has a huge conflict with Robin. Robin was his peer and applied for the Managing Director job too. Robin failed and Mark succeeded. Robin has been now moved to another division that is supposed to work closely with Mark’s business. Robin seems to hate Mark, and both stopped talking to each other after Mark’s promotion was announced. However, they both need to work together to be successful in their new jobs. Good rapport between people makes it much easier to communicate. Indeed when with good rapport comes mutual respect and understanding. At the same time, words and ideas flow more easily. The research shows that nonverbal communication is essential to good rapport. The importance of nonverbal communication has been understood since the 1960s when UCLA professor Mehrabian identified the three elements of a face-to-face conversations: words, tone of voice and nonverbal communication, such as hand gestures and facial expressions. Professor Mehrabian believed that nonverbal communication made up 55 percent of an effective, impactful conversation. He then listed tone of voice as making up 38 percent of the actual words of the conversations as having only 7 percent of the overall impact. Clearly both verbal and nonverbal communication contribute to effective rapport and open dialogue. In addition to nonverbal communication, matching and mirroring are other ways to establish good rapport: it is all about finding the rhythm of the conversation and being in synchronisation with the person we are talking to. It is about paying attention to how they are thinking and talking, what energy they are displaying, what words they are using. It is also important to notice how the person is breathing and moving. When all those things are synchronised between two people, achieving good rapport and having an effective conversation is more likely. That links back to the fourth NLP principle: mind and body are part of the same system. In the case study, that tool is firstly important for the coach to establish trust and good rapport with Mark. Mark has been in corporations all his life and he is calm, composed, well-spoken. He breathes slowly and speaks confidently. He also uses executive language and jargon from his business world. So, the executive coach could do his homework to understand Mark’s organisation, the language that he uses, where Mark is coming from, as well as match and mirror Mark’s verbal and body language. The discovery session with an executive client could be a great opportunity for an executive coach to ask for relevant information about the company and the division the client belongs to relevant presentations, organisation charts, a list of key acronyms used in the business. That will enable the coach to have the background knowledge to be more effective during the coaching process. That will also certainly help to create trust between them as Mark will feel understood, in familiar territory and can go straight to the core of the issues without wasting time on giving tons of background and explanations. During the coaching process, one of the obstacles that Mark sees is the relationship with his peers. The executive coach could help him become aware of the power of nonverbal communication, matching and mirroring when he is able to use that with his former peers and now his team. It will be critical for Mark to step into his new role and find ways to improving rapport with his team. As per the second NLP principle, the mind can form powerful links to positive and negative experiences, which can be used to a person’s advantage. The mind is especially great at creating links or anchors to moments or experiences in life that were particularly impactful. Often that is helpful but sometimes those anchors can also be a nuisance if they weigh the person down with unwanted emotions and reactions. Anchoring aims to elicit a habitual, positive emotional response to a specific word or physical stimulus. For example, a therapist may be able to induce a patient to smile whenever someone touches their shoulder. This is an extremely powerful way of instantaneously changing the way a person feels and works well in long term therapist-patient relationships. It could also be very useful in coaching. NLP offers a three-step technique to create new, positive anchors that can help a person get through challenging situations. The first step is to think of the emotional state the person wants to be in. Happy, energetic, calm – he or she picks the ideal state and keep it in mind. The second step is to think of a moment from the past when the person was in this state. Perhaps that was when that person was previously promoted or when he or she passed a test. – whatever it may be, the person holds on to that moment. The third and final step is to think of the sound or movement or word that you want to associate with this emotional state – it could be anything from a song to a hand gesture like a thumbs-up. Once the anchor is in place, the person can put it to use at any time. If it’s a happy emotion they could give themselves the thumbs up and bring themselves back to the positive experience that it’s anchored to. That also relates back to the fifth NLP principle: images, sounds and feelings are resources that could be used to get our desired outcome. In the case study, the anchoring tool could be used at least in two instances: first Mark has negative thoughts about the new role and how he is going to perform. He says: “I am going to fail, I do not know anything about the new job, I am not enough qualified for the job.” The consequence of those thoughts is that he is paralysed by the fear of failing and not able to take the necessary steps to have a chance at succeeding, i.e. build an action plan to learn about the job and to fill the competency gap if any. The coach could ask him: “in which emotional state would you like to be to set yourself up for success”? The client might answer in this instance: “calm and confident.” That is the first step of the anchoring process. Then the coach could ask: “in which situation in the past did you feel calm and confident?” The client might answer: “when I was promoted to CFO it was a similar situation as I had never been a CFO before and it was a big step up for me. However, I felt calm and confident at the time: that enabled me to build a team that was complementary to my skillset, to rely on my strengths and get the quick wins that built up my confidence.” That is second step of the anchoring process. Finally, the coach could ask: “what would you like to associate that emotional state with?” The client might say: “I absolutely love Queen and the song – we are the champions – I even have the track on my phone. When I listen to it, I already feel more confident and calmer.” That is the third step of the anchoring process. By starting each day with the listening of the song, Mark could train his brain to get to the emotional state of calmness and confidence that he needs to be successful. To navigate through challenging situations, NLP has identified five logical steps to help understand where in people’s life a challenge stems from: environment, behaviour, capabilities and skills, beliefs and values, identity. For example, a student is in medical school and suddenly realises that he does not want to be a doctor. That reflects a situation that has to do with his beliefs and values. It is an internal dilemma. No matter what the situation there is a three-step logical levels model that can help a person get to the bottom of things. The first step is, naturally, to recognise that there is a problem. Sometimes things happen gradually such as growing distant in a relationship with a friend so before that can be dealt with it is key to be in touch with the feeling that this has brought about. The second step is asking the right questions to determine the cause of this problem and what logical level it represents. It is an environment problem – maybe it started when you moved to a new area that is far away from your friend? Or is it a behaviour problem – maybe there is another person involved? Or maybe it’s a values’ problem: you and your friend are no more aligned in terms of what you want out of life. That process links back to the second NLP principle: we have structures that impact the way we feel, and it is critical to understand them. Finally, once the person has pinned down the kind of change that needs to be made, he or she can think about the appropriate action. Depending on the type of change needed a coach might be helpful. For instance, a coach could support a client clear a limiting belief and replace them with empowering ones. That is easier said than done and there are lots of tools that go beyond NLP and could be useful for a coach to refer to: please check out “clear your beliefs” training by Lion Goodman. Mark wants to move to the corner office that his predecessor had. That falls in the “environment” category in the 6 logical level model. This is something that does not require an internal change on his part; it could be changed by talking to HR or facilities and getting approval to relocate by presenting a good business case for it. On the other hand, Mark appears to have a limiting belief that brings his energy down: he is convinced that everybody wants him to fail. That problem requires an internal change on his part and it is a much more complex process. In this instance, NLP techniques might help but not be enough to clear the belief. That is why I referred you to a powerful approach in my opinion: clear your beliefs by Lion Goodman. The study of this approach is outside the scope of this research paper. The meta-model helps people ask the right questions to get more meaning from conversations. What happens when people struggle to find the right words? When people express themselves there are three processes going: deletion, generalisation, and distortion. Deletion represents the fact that people usually leave certain things out when they are explaining themselves. When a co-worker is asked what he did during the holiday, he might respond that he went to see a movie. Clearly, he has done more than that. Generalisation refers to how often people are vague or unspecific in details and tend to extrapolate the outcome of one situation and apply it to another. A friend might explain that she performed poorly on her last test and that, therefore, she feels like a complete failure in general. This is obviously a rather wide generalisation. Distortion means misinterpreting events around you. For example, if a manager does not greet one of his employees in the hallway, that employee might immediately conclude that her boss hates her and it’s clearly a distortion. The manager might just have been preoccupied with something else. By being aware that these processes colour the way everyone describes experiences, a person will be much better equipped to understand and communicate with others. This refers to the first principle of NLP: everyone builds their own maps of reality. And a good way to clarify the reality of others is by asking the right questions. “What did you do to get the job? What did you learn through the recruitment process?” It is highly likely that to get the job, Mark demonstrated skills that could be transferred into the new job. By realising that and hearing himself talk about his strengths, it will help Mark to shift his perspective and think more positively about his capabilities for the new job. “What do you mean by everybody? What makes you think that they want you to fail? What is the consequence of such a belief?” Through powerful questioning, the executive will become aware of the underlying belief behind that statement and the consequences of that belief. 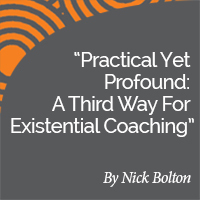 More tools than NLP might need to be used during the coaching process to clear that belief but to identify the belief and its impact is already a big step forward. To visualize is to imagine or paint a picture of something in one’s mind. Here is an example of visualization: when an athlete closes her eyes and imagine herself crossing the finish line of a race. Visualization is one of the most powerful NLP exercises coaches could use. There is scientific evidence to support the power of visualization. Olympic athletes have been visualizing for years to improve their performance. Studies have been performed on individuals which evidences that the brain pattern activated when a person is physically completing an activity i.e. play golf is like when the person is visualizing the step by step process they would follow. That technique uses the third principle of learning and the fifth principle about the usefulness of images. Indeed, as visualization is used by successful people such as Olympic athletes, NLP coaching applies it to individuals to help them achieve their goals. With executives I use the NLP visualization technique in a particular way: it is called the miracle question(2). The miracle question or “problem is gone” question is a method of questioning that a coach, therapist, or counselor can utilize to invite the client to envision and describe in detail how the future will be different when the problem is no longer present. Whilst relatively easy to state, the miracle question requires considerable skill to ask well. The question must be asked slowly with close attention to the person’s non-verbal communication to ensure that the pace matches the person’s ability to follow the question. Initial responses frequently include a sense of “I don’t know.” To ask the question well this should be met with respectful silence to give the person time to fully absorb the question. For Mark the miracle question process could help him have a clear picture of where he wants to get to and help him identify action steps to move in the right direction. The more precise the vision is, the more his brain will believe this has actually happened and that will accelerate the creation and the execution of a plan of action. This tool could turn out to be very useful to resolves conflicts, to shift perspectives and to make progress that is in the interests of all parties involved. John Grinder and Judith Delozier modelled people that were skilled at negotiating a way forward that was a win for themselves and a win for the person or people with whom they were negotiating. 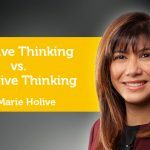 They found that those people were able to experience a situation from many different perspectives and that it was this mental agility that enabled them to gain the insights that provided the breakthrough. There are three primary positions that I will focus on in the case of a conflict between two people (you and someone else). The first position is to be in your own shoes, we are able to connect with what is important to us personally. We need to be able to see, hear and feel the situation from our own perspective. We speak using the language: I feel, I hear, I see, that will inform us on our map of the world and what we really want. The second position is where we put ourselves in the other person’s shoes. It is more than just thinking about their perspective, it is about experiencing the situation as if we were them. When you are fully in the other person’s shoes you are able to understand their map of the world. The third position is one of an observer. You have the ability to stand back from a situation and experience it as if you were a detached observer. This is a position of analysis and learning. It is unlikely that you have emotions as you dissociate from what’s going on. At the end of the process when you come back into your own shoes, you are a different person because you learned so much about the different perspectives and this is when you might see a constructive way going forward. This tool obviously links back to the first principle of NLP: there are different maps of reality by an individual. Getting a better understanding of other’s people maps opens new possibilities and solutions. You might use spatial positions to support this process. For example, you can ask Mark to change physical places as they move from one position to the next. Invite Mark to take a seat or to stand in a place that represents them in their shoes. It is critical to use the present tense. Finally, the coach summarises what they have heard using Mark’s language, so they hear the scenario mirrored back to them. Break state: Then the break state is important: invite Mark to stand up and shake off all the emotions of that first position. Invite them to have a glass of water and ask them when they feel ready to move to the next position. Ask Mark where he would like to place Robin in the situation/relationship. Prepare a chair so they can sit or stand in this position. Finally, summarise in the present tense what they said. This is the position in which the executive coach invites Mark to put himself in the shoes of an observer so that he can see himself and Robin from a distance. Mark takes an overview of what is happening in the relationship. This is where Mark learns about the situation. The goal of the exercise is to learn before doing anything. This is often significant learning for executives going through the process as they are usually encouraged to focus on tasks and actions. Mark then goes back to being Mark, but he is transformed and you as the coach could ask: “what would you like to say after what you have been through? How might you go forward about this situation? The body language affects how others see us, but it may also change how we see ourselves. Social psychologist Amy Cuddy argues that “power posing” — standing in a posture of confidence, even when we do not feel confident — can boost feelings of confidence and might have an impact on our chances for success. In the same way, if we look down with a defeated posture that may accentuate our negative feelings about the situation or ourselves. If we take a “positive posture”, looking up and smiling widely maybe that will help to start feeling more positive. Our body is sending a signal to our brain and we can take control of what that signal is. That realisation links back to the fourth principle of NLP: mind and body are part of the same system. A change in posture could affect the way we feel. In the case study, Mark is worried about his public speaking abilities. It is one of the obstacles he has to overcome. As he describes to the coach one of his bad experiences, he talks about how he was looking down by fear of reading people’s reaction in the audience, how he was bending his back in a defeated position and how his whole-body language was betraying his lack of confidence. So, in addition to the anchoring technique, to work on his posture and body language could be a key to how he feels when does public speaking and how his audience perceives him. By helping Mark to become aware of the importance of his body language, he can identify some development plan to match his desired outcome. There are many other NLP tools that can be explored. In this section I would like to introduce a few that could be directly applied to coaching. Goal setting is a critical step in the coaching process. NLP suggests some interesting new insights, focusing on satisfaction and not dissatisfaction. For example, it is helpful for clients to make the goals positive; focus on what they want to have, not what they would like to lose or not have. It is also more effective to think about what it is that they really want. For example, they do not actually want to buy their dream house, you want to live in it. It is much easier to get motivated about a goal that really satisfies the client. Powerful questioning is at the core of the coaching process. Brandler suggests that our minds actively look for answers to questions. So, the coach asks: ‘What is it that makes you feel bad?” the mind of the client will find lots of answers and the client might feel worse as a result. With NLP the key is to ask the right questions, for example: what do you want to change? What life would be like when you have changed? What do you need to do more/less of in order to change? That type of questions naturally leads to a more positive outlook. The idea behind this thought process is that it helps the client see how people or events affect them and understand the way they feel about them. By changing those images in their mind, they are teaching their brain to magnify good feelings and make negative feelings weaker. As per the fifth principle images of the mind are resources that could be used in a powerful way to influence how we feel. Letting go of the past: sometimes, for a client to move forward, they need to get over a bad experience. An NLP tool called “running the movie backwards” could be useful. The coach could ask the client to start from a point in time when they realised the bad experience was over, and then to imagine the whole incident happening backwards until the person goes back to a time before the event happened. The coach could ask the client to do this a few times to be familiar with the way that the film plays. Then the coach could ask the client to make the movie really small in their mind, little enough to view on a smartphone and then he can play it backwards again. Finally, the coach could ask the client to think of a different end to the experience, one that makes them smile and to describe how that makes them feel. The key to this technique is to show to the brain of the client a different way of looking at a memory which will change the way about how they feel about it too. That links back to the third NLP principle: how the subjective representations of experience have a discernible structure and how this affects how we feel. It also links back to the fifth NLP principle which is that images are resources to use. 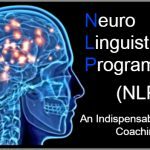 The tools described in the above sections are just a flavour of what NLP offers and I invite the reader to go deeper into NLP if they are interested. The next section of this research paper provides a list of ICF approved NLP trainings and the references used to write this paper. Those are good starting points to go to the next level of coaching with NLP. NLP at Work: The Essence of Excellence. Book bySue Knight. How to Take Charge of Your Life: The User’s Guide to NLP, by Richard Bandler, Alessio Roberti and Owen Fitzpatriack.